The Eurovault Aver Grade 0 Series from Burton Safes is available in a range of seven sizes and offers high security protection from theft. Tested and certified by ECB-S to EN 1143-1 Eurograde 0 standard ensuring a cash rating of €6,000 or valuables rating of €60,000. The Eurovault Aver Grade 0 is also approved by the Association of Insurance Surveyors (AiS). Secured with a high security, double bitted key lock supplied with two keys. Optional lock upgrades are also available including electronic or mechanical combination locks. High security dual locking by way of a key and combination are also available. 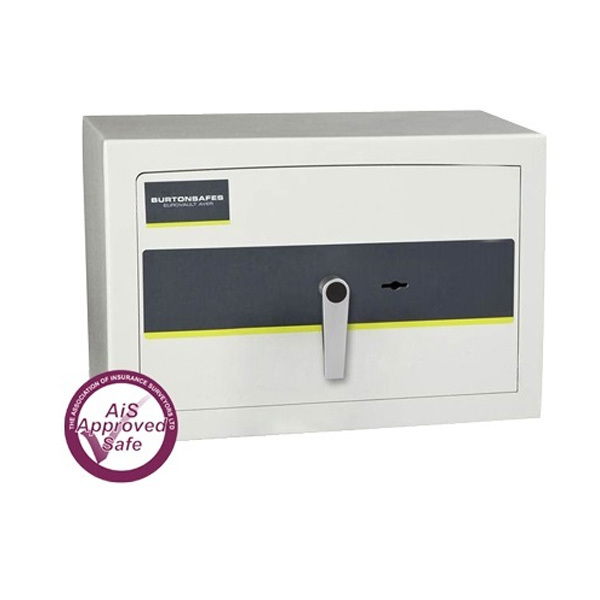 Eurovault Aver Grade 0 safes are constructed using a double walled steel body with a special composite security fill and a 10mm thick, solid steel door. Additional security is provided by 3-way moving bolt work and drill protection of the locking mechanism. Finished in a light grey paint with anti-rust treatment and pre-drilled for base fixing either on a DIY basis (bolts included) or by our own professional engineers.